So the newest mall in Muscat to open up (it's not actually open yet) is going to be the Panorama Mall which is located on the road between the MGM and the traffic lights by the Al Ameen Mosque in Bowsher. The last opening date was supposed to be the 10th of September but this was unfortunately missed, and the next date announced by the management (on it's facebook page) is "before Eid) - so perhaps they'll see you next Tuesday! From looking at the floor plans, the mall looks like it will be pretty nice, with a decent layout. I have, over the last half year or so, repeatedly attempted to get a full list of outlets signed up for the mall from the management but they have repeatedly refused to give me their list. I've built the list below mostly from their public facebook page and instagram page where they are announcing their new signups, so the below list is not an entire list of the stores that are going to be at the Panorama mall. This mall does not yet appear to have many "big" international brands (the odd one here and there) and over 55% of the outlets listed below are food and beverage outlets, along with a supermarket (the second Spinney's to open in Muscat), a City Cinema and some kids play places. This mall will probably be best to go for a meal and/or to get the kids out of the house. 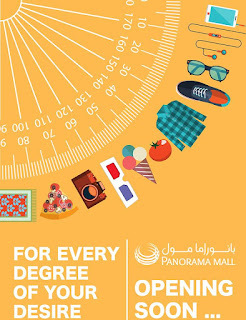 It seems that the big GCC retailing houses, Apparel Group, Alshaya and Landmark Group have decided to stay away from this mall, which actually makes this one different from the rest of the malls in town, but it also means that none of the usual brand's you see in other malls here are going to be found in the Panorama Mall.